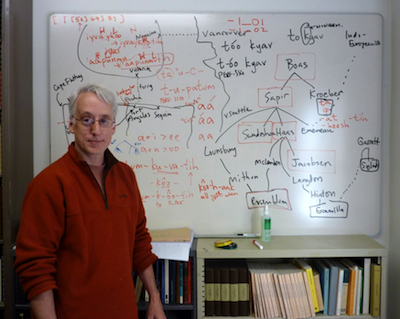 Garrett (PhD Harvard 1990) is Professor of Linguistics and Nadine M. Tang and Bruce L. Smith Professor of Cross-Cultural Social Sciences at the University of California, Berkeley, where he also directs the California Language Archive. His research mainly concerns two areas. In historical linguistics, he works on Indo-European and on the languages of northwest California and is especially interested in the causes of change and the mechanisms of diversification. In language documentation, working with the Yurok and Karuk languages of northwest California, he is especially interested in philology, text corpora and linguistic resources that are useful to academic and non-academic stakeholders, and grammatical pedagogy for language restoration. Phylogenetic methods adapted from biology have been used in historical linguistics for over a decade now, with some results that are generally accepted and others that remain controversial. The latter include analyses of Indo-European basic vocabulary traits to cast light on the chronology of Proto-Indo-European and its immediate descendants. Well-publicized studies (e.g. Gray & Atkinson 2003, Bouckaert et al. 2012) are consistent with an Indo-European chronology that is far earlier than what most linguists have assumed, and that would support Renfrew's (1987) model of Indo-European diversification through the initial spread of agriculture before 6000 BCE. A study by Chang et al. (2015) finds instead that Proto-Indo-European was probably spoken around 4500 BCE, through a phylogenetic analysis of basic vocabulary traits in which known linguistic descent relationships are stipulated (e.g. between Old and Modern Irish). Informal criticism of this result has largely focused on the plausibility of such relationships. In this talk, after reviewing what is at stake and summarizing the results of Chang et al. (2015), I will defend the linguistic reality of the ancestry relationships assumed in our work.